Nedware is inspired by my love of the Maine Coast and the Maine Woods—the sun, the sky, the wind and of course—the earth—abundant source of sustenance and origin of CLAY! Nedware began as a business in Maine in 2012. 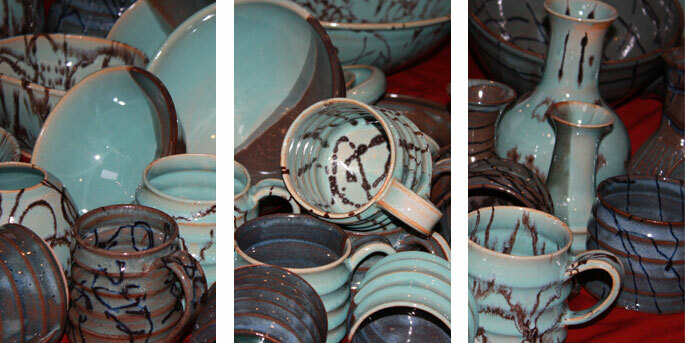 The work is all handcrafted pottery made in a small garden-shed studio in North Yarmouth. The pieces are formed from stoneware mostly on an electric potter’s wheel and “bisqued” in an electric kiln to 1790° F to harden the work. The partially fired pots are then dipped in and decorated with glazes formulated in my studio. The final firing to about 2230° F (called cone 6) makes them hard, durable, and impervious to liquids, but not unbreakable. The finished pots are food, dishwasher, and microwave safe. Nedware focuses primarily on functional pottery—I particularly like to make bowls: deep and shallow, tiny and huge. I just love their roundness, their versatility, how they contain things. I create vases, mugs, tumblers, plates and platters, lamps, flowerpots, and mirror frames too—and the list continues to expand. My pottery is informed both by elements of the natural world and by abstract design. Nature creates patterns that are more abstract than any modern painting I’ve ever seen. I don’t imitate it as much as I draw inspiration from it. And just as nature is always changing, my style continues to emerge and develop with time. On the website, you will find the Home Page, About the Artist, the Gallery, and “Nedware for Sale”. The Nedware For Sale page is the place to go to see what I currently have available online. The pottery shown in the Gallery is not for sale. If you see something you like either in the Gallery or Nedware for Sale and want a variation, you can call or email me and we can discuss the possibilities of a commission. I ship via the US Postal Service, UPS, or Fed Ex depending upon what is least expensive and most convenient. My work is guaranteed, so if you are not satisfied for any reason, please call me at 207-400-6320 and I’ll try to make it right.